In case you watch our YouTube-Videos, you might noticed that we’ve been talking more about Gutenberg lately. Gutenberg is currently the “Hot Topic” in the WordPress world. At the moment Gutenberg is only available as a WordPress plugin. This way we can test the new WordPress Editor now, before Gutenberg will officially replace the current WordPress TinyMCE editor in WordPress version 5.0 (the release is planned for April 2018). It seems as if a new WordPress era begins with Gutenberg. Over time the plan is to change the entire experience on how we use WordPress now. First it will change the way we write posts and pages, later on Gutenberg is expected to change the way we build our entire websites in WordPress. Therefore it’s important that we follow the Gutenberg project closely and as early as possible (if you haven’t already of course). It’s also our job as WordPress users and developers to text Gutenberg and give feedback to the Gutenberg development team. Theme and plugin authors are of course especially challenged, as Gutenberg is likely to change lots of things plugin and theme related in the near future. In the last weeks I have been working with Gutenberg more and more and even though there has been lots of criticisms from the WordPress community, at Elmastudio we are looking forward to the changes. At the moment there are alternative website providers such as Squarespace or Wix that make the process of building a website much easier (especially for beginners), than it is currently possible with WordPress. That’s why we think it’s really important to improve WordPress in this area to the point that it will even innovate the current state of ” website pagebuilding”. So, yes, we are pretty excited about Gutenberg. 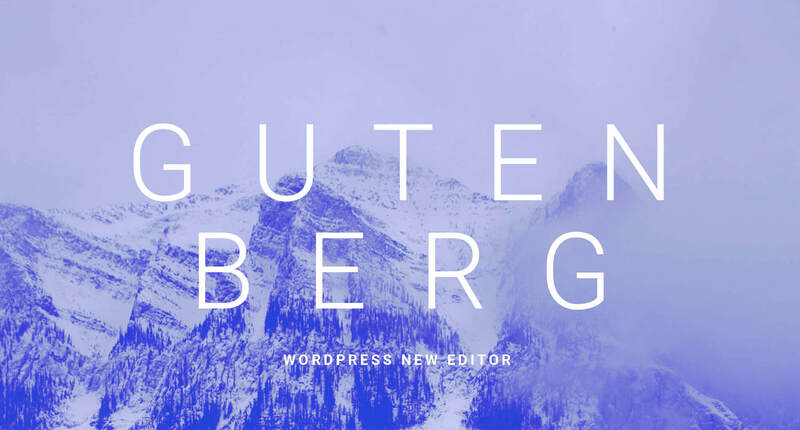 With it’s first release (in WordPress 5.0), Gutenberg will mainly be an update of the current editor experience. In one step further customization will be improved and as a third step a complete pagebuilding experience should be made available in WordPress core. But what is Gutenberg exactly? The big keyword in Gutenberg are the so called “blocks”. Right now there are many different elements that we have to handle in our WordPress admin area. There are posts and pages, widgets, menus, customization options in the Customizer and so on. Ultimately, Gutenberg’s intention is to simplify all these different elements and turn them into blocks. Blocks can be compared to Lego blocks, so they are building blocks that help you build your website in a flexible way. At the moment, however, Gutenberg is only an update of the editor. In the following video, I’ll show you how the Gutenberg editor will work and what the current state of the Gutenberg plugin in version 2.0 looks like. So blocks are available in the editor and there are blocks for the different post and page elements such as paragraphs, headings, images, image galleries, lists, quotes etc. In order to be prepared, when the new editor is officially integrated in WordPress, it’s important to install and test the Gutenberg plugin during it’s development process. Although it’s not advised to use the plugin on live websites right now, you can still use the plugin. For example, if you have a WordPress test website or you have installed WordPress on a local server. There you can install and test the Gutenberg plugin. 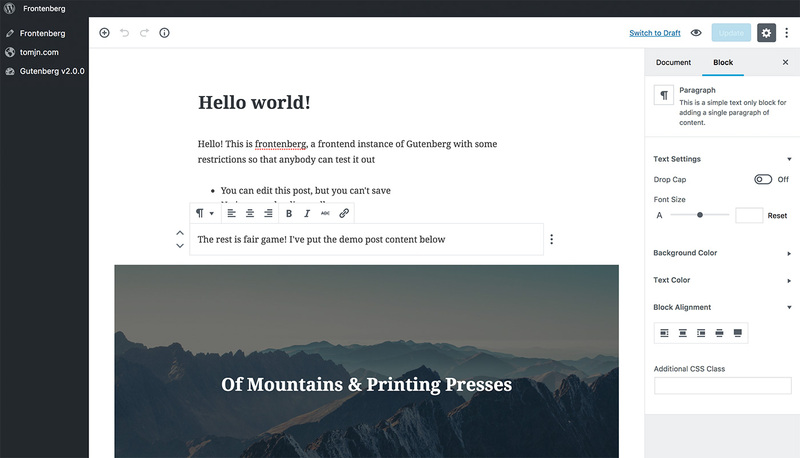 All others can have a look at an Gutenberg project called Frontenberg, which shows you the current Gutenberg version live as a Frontend version and you can test the state of the plugin there as well. A helpful guide to learn more about Gutenberg is the Gutenberg Handbook on WordPress.org. Another super helpful source is Morten Rand-Hendriksens talk “Gutenberg and the WordPress of Tomorrow” from the WordCamp US 2017. What do you think about Gutenberg and what questions or concerns do you have? Do you have any suggestions for further blog posts and videos about Gutenberg that you would find helpful? Just write me your questions and ideas in a comment! Hi Ellen, first of all a big praise for the time and work you put into your YouTube videos and articles like this one. It is currently very important to educate as many users as possible about Gutenberg and make them aware that WordPress will change in many ways, although it is not 100% clear where exactly the journey will go (especially regarding the 2nd and 3rd phase of Gutenberg). I’m basically optimistic about the future of WordPress, even though I disagree with some of the decisions related to Gutenberg. In my opinion it goes too much in the direction of WordPress.com, which is not surprising given that Gutenberg has mainly been introduced by Automattic folks. I expect WordPress will become an all-in-one site builder, with as many tools and modules as possible implemented by default (similar to the competition to .com). Whether this circumstance will still leave room for a variety of different themes & plugins isn’t clear yet. If WordPress Core at some point already covers most of the use cases through numerous integrated blocks, then I do not really see a need for a rich ecosystem of independent developer products like we have today. The winners will be hosting providers like WordPress.com, which in principle sell their hosting packages (+ Jetpack), and the integrated all-in-one site builder will then cover everything else. Of course there will always be niches in which you can do business as a small company. However, time will tell if we’ll still see a rich ecosystem of successful themes and plugins. I think WordPress themes in particular will become more like style guides and hardly provide any additional functionality. How many different “Gutenberg” designs can then be on the market before a saturation occurs? Even today, many themes look already the same and often differ only in functionality and minor details. I also think the criticism from the community related to Gutenberg is not necessarily about the project itself. Probably most people would agree that the editor should be revised after more than a decade. I think the criticism is more about how Gutenberg is being introduced, especially in terms of the tight timeline and the vague information policy. The biggest issue at the moment is that as a developer (and company) you currently can hardly plan into the future and certainly not develop new products. It is not clear yet how WordPress will work after phase 2 and 3 of Gutenberg (especially considering that at some point every element in WordPress should be a “block” – including menus, logo, widgets, etc …). Excellent Gutenberg commentary Michael. You voiced my concerns accurately. So we will see an compatibility update for Elmastudio Themebundle after releasing WordPress 5.0? I think with Gutenberg many plugins being useless for my private customers. But what about themes? Allison has a point … it would be nice to have infos on the Gutemberg support / main issues with your themes (if not today, at least somewhere near the official release). you are totally right, thanks for asking this question. We are currently working in the background to assure our themes will support Gutenberg. Our latest theme Pukeko will soon be released with a first support for the Gutenberg plugin, so you can start testing Gutenberg directly with our themes.